Derry City defender, Ciaran Coll hasn't sustained a broken leg despite initial fears. 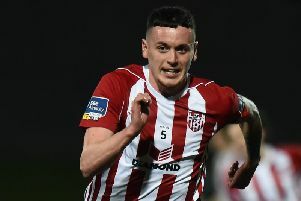 DERRY CITY received a major boost with news emerging from Brandywell this morning that defender, Ciaran Coll has not sustained a broken leg. 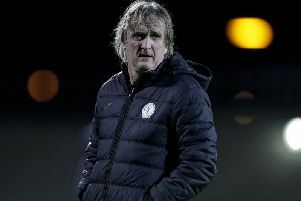 Coll sustained a nasty injury as a result of a shocking challenge from Finn Harps defender, Colm Deasy who was shown a straight red card by match referee, Neil Doyle in the first half of a feisty north west derby at Finn Park on Friday night. Ex-Finn Harps captain, Coll, was stretchered off and taken to hospital by ambulance during the match but initial x-rays fortunately found there was no fracture. However, the extend of the damage won't be determined until the significant swelling subsides. The club plan will await further tests to investigate any possible ligament damage which could still rule him out for some time.